This issue of FAB is in its wider sense devoted to “language history”. 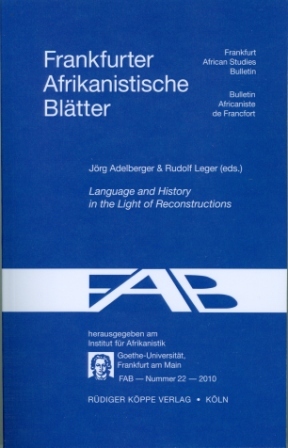 It comprises a variety of relevant articles on language reconstruction and language use, shows the diverse scholarly approaches of the contributors towards historical aspects in a convincing way, and at the same time reflects their ongoing research interests. The different case studies presented in this volume may be seen as general outlines, but also as detailed in-depth studies which examine different views of comparative historical linguistics and oral traditions. The geographical zone dealt with covers the central and eastern Sudanic region reaching from Nigeria up to Egypt. This linguistically heterogeneous and fascinating area is highlighted and may enable the reader to get a more profound impression on distinct languages, their historical development and changes, filling a gap that had hitherto existed in comparative as well as descriptive studies. The articles may serve as a key for future comparative analyses of diachronic and synchronic linguistic processes within the wider Sudanic region.